It has been a busy time for us. I apologize for posting less often. I am just now feeling mostly recovered from a nasty bout with bronchitis and, well, some sort of evil virus. Also, I have been working hard with an interactive online French program each night after the kids are in bed. This is both an attempt to facilitate better communication patterns within my predominantly French-speaking community and also a necessity for keeping up with my French Immersion-schooled kids! In any case, I still desire to make time for recording the Tapper happenings for our own future reference and for your reading pleasure. On Thursday, all six of us went to the church to help prepare for the Good Friday children's program. We put together a prayer labyrinth similar to others we have used in the past (based on Sue Wallace’s Multi-Sensory Church [Scripture Union Press 2002]; see also this link), but adapted to include younger children. The Tapper kids loved being part of setting up the stations. Laying the tape for the labyrinth pathway was certainly a highlight, too. What a joy to see their excitement in anticipation of participating together with their church family in the next day's services! Indeed, the Good Friday service and children's prayer labyrinth afforded a special chance to contemplate God's love ansd provision of salvation. Andrew and Ethan both spoke of sensing the wonder of God's forgiveness as they participated in the communion service. Abby and Jadon commented on the experience of feeling some nails and thinking about what Jesus must have felt. Discussing the reality of Jesus' sacrifice together was truly meaningful. On Saturday, we enjoyed Easter dinner with Mike's family. On the drive over to his parents' home, we had another meaningful family experience. Stopped at a red light in the city, Mike suddenly called to the boys in the back seat: "Get one of the bags!" The boys scrambled to reach under their seat and grab a gallon-sized plastic bag, stuffed with an assortment of small food items and toiletries. Mike rolled down the window and motioned to the young man who was walking slowly along the row of cars, hands reaching beseechingly. He responded eagerly to Mike's communication, jogging over toward our van. "I don't have money, but you can have this," said Mike. The man reached out, took the offering, and turned it over, examining. Suddenly, his face lit up. "Are those socks?" he asked. "Those are socks in there!" he exclaimed, as his feet danced a bit and his smile grew. The light changed, and we drove away--six Tappers sharing smiles with a stranger. Of course, our best efforts to facilitate spiritual understanding and to promote spiritual disciplines sometimes have unexpectedly humourous results. 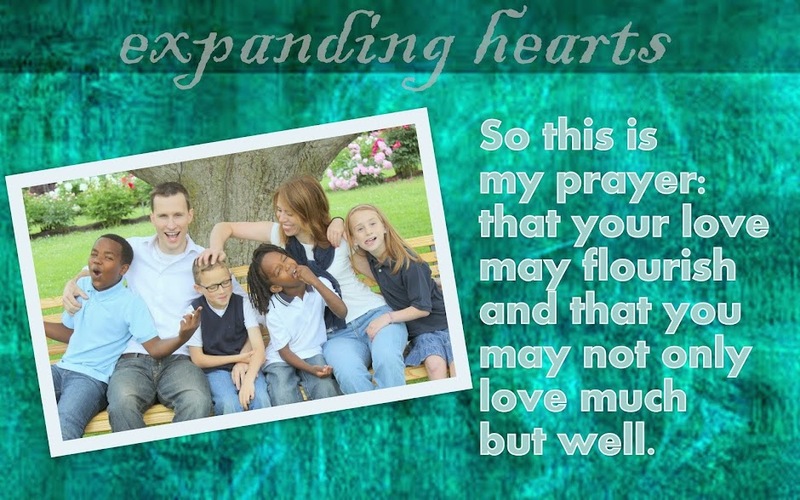 We have been experimenting with various "techniques" for encouraging thoughtful prayer. One recent approach has involved a hand prompt. In this technique, each of the five fingers, starting with the thumb, represents an area of concern which can be discussed in prayer: 1) the thumb represents those closest to you, especially family and close friends, 2) the pointer finger represents those who seek to give direction, such as teachers, coaches, or pastors, 3) the middle finger represents those in leadership or authority positions over others, 4) the weak fourth finger represents those who have needs relating to illness, life trials, loneliness, etc., and 5) the pinky represents one's self. After several nights of using this technique and discovering new and varied areas for prayer, we have found our children increasingly expressive during our prayer time. It was, however, hard to keep a straight face when Jadon, having volunteered to pray before our Easter dinner at the Tappers, bowed his head and offered one succinct prayer: "Dear God, thank you for the Canadian government." On a more serious note, significant meaning to our Easter weekend through the use of an "I'm Sorry" box. Created before the start of Lent, the box is quite simple--all closed up except for a small slit in the top. Throughout Lent, we encouraged the children (and ourselves!) to confess our "bad choices" not only to each other, as necessary, but also by writing a small note and placing it in the box "where only God could see." On Saturday, we took the box outside, lit it on fire, and burned it away. Nothing remained. While we all knew from the beginning that this was the plan for our "I'm Sorry" box--a symbol of God's absolute forgiveness of our sins because of Christ's atoning sacrifice, watching that box that contained our symbolic "bad choices" disappear was clearly impacting for us all. Finally, we continued our tradition of egg-hunting on Easter Sunday. Rather than filling eggs with chocolate or other treats, we--each individual member of the family, that is--take time before Easter to write encouraging notes to each other. The notes are sorted by recipient (each with his or her own particular color of egg) and placed in plastic eggs. 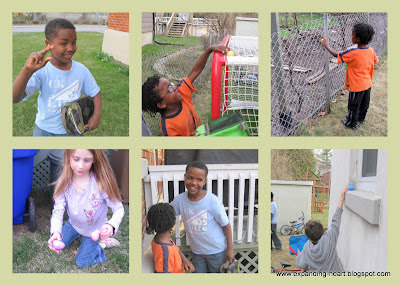 The kids hunt in the backyard for their own color as well as Mom and Dad's eggs. 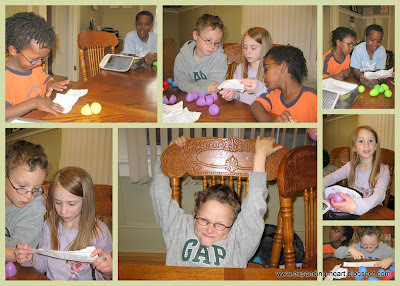 After all the eggs are found, notes are read aloud together. I love to see the beaming faces that result from this uplifting tradition.